I had Tyler by half a football field, but he had easily closed the gap by the time I reached the mine’s entrance. What had he seen back there? What motivated him to sprint over rock-strewn rail tracks in total darkness? ‘What did you see?’ I huffed once outside. He was white with terror. 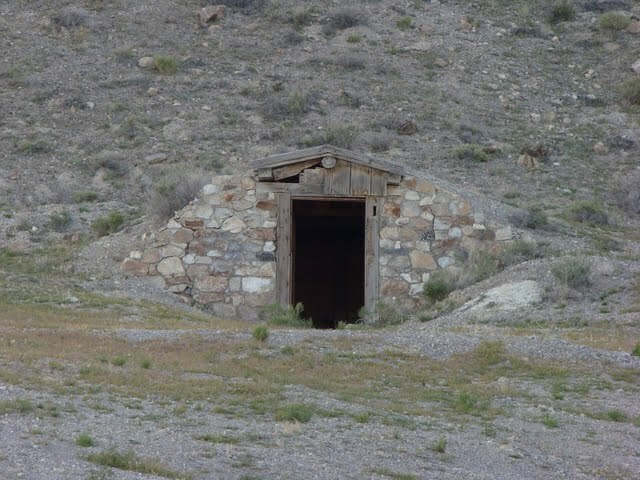 This mine is one of many abandoned mines that remain in remote corners of Western Utah. This one is similar to the mine I discuss in this true story. The preceding story is an adaptation of an article I wrote last October for the Tooele Transcript Bulletin, and is first in this year’s Halloweentime series here at BonnevilleMariner.com. I nervously balanced on a rail track that ran from the tunnel’s entrance and past me into the darkness. The adit had curved enough over the distance that only a few dusty rays of light were still visible from its mouth. I checked my watch, as if I had any way to gauge the minutes — as if I had even bothered to note the time when we entered the abandoned mine. Only one thing was certain: Tyler should have been back by now. I’ve always wanted my own scary story — one fit for Halloween and the spookiest campfires. For years, I had listened to my inordinately danger-prone aunts spin horrifying yarns at our annual family camp out. Each year I would sit petrified by the fire as Sandra recalled a threatening phone call she received while she was baby-sitting in a house at the end of a long, dark street, and about being stranded in the mountains and stalked by a group of drunken men. Aunt Kim would follow suit with her story of discovering something that looked a lot like a shallow grave near her campsite, which curiously coincided with a blanket going missing from her tent and news sightings of an infamous serial killer. None of this could be verified, of course. 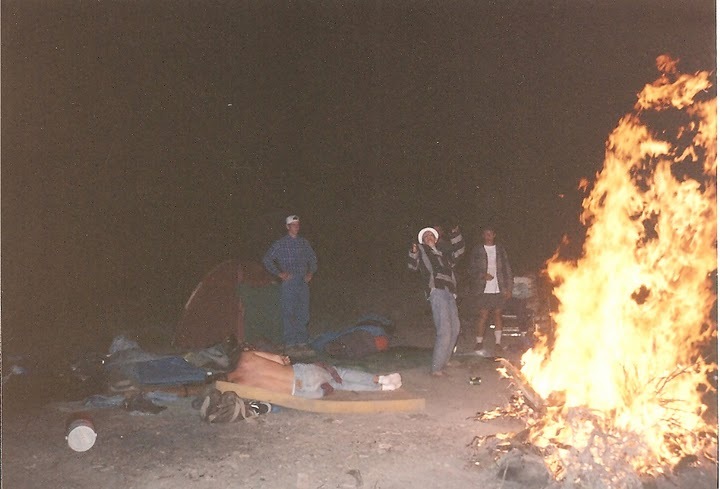 Still, my young siblings and I were always terrified to walk back to our tents after the embers cooled. Aside from a few dicey climbs and getting briefly lost once in the Uintas, I never had a scary tale of my own. That thought crossed my mind momentarily in the tunnel — sometime between being anxious and worrying that Tyler was dead. I stood on the tracks looking into the darkness. Panic hadn’t yet set in, but it was close. It happened years ago, before we realized that flippantly walking into abandoned mines was an amazingly dumb idea — and at a time when I thought there was a decent chance that my friend Tyler might be insane. We were somewhere — no need to specify exactly where— in the west desert. The allure of the dark opening on the hillside was just too powerful. We stopped to inspect the exterior, but rushed inside to escape an ambush mosquito attack. We had already walked 20 yards into the mine before we actually made the conscious decision to do so. The adit, or horizontal shaft, stretched on immeasurably before us, and the path was clear as far as we could see. Neither of us had a flashlight at hand — we hadn’t planned to enter the mine, after all. Except for an ominous musty smell and the fact that several sections of the adit looked to be entirely supported by flimsy wooden braces, the mine seemed safe enough for a quick peek. I stopped at about 50 yards, just under a wooden portal of sorts. The mine’s spell on me was broken when the tunnel’s curve nearly extinguished the daylight. I was done, but my resolute friend vowed to continue, and I knew there was nothing I could do to stop him. Tyler was the most determined person I had ever known — often to the point of irrationality and even in the face of potential disaster. I knew he wouldn’t stop until he either reached the end or was crushed by falling rock. He trudged forward, using his video camera’s viewfinder for light. I watched its red LED as he disappeared ahead of me. It glowed for another minute, then it too was gone. For several long minutes, the tunnel was still and silent. I paced the rail tracks, becoming anxious, then seriously worried, with fleeting thoughts of Sandra and Kim and the scary story I might be able to tell at next year’s campfire — should we survive. Tyler was also the most fearless person I had ever known, which is why my heart jumped when I heard him screaming in the distance and saw the camera light reappear and shake as he ran toward me. “Clint — run! Don’t stop!” I had him by half a football field but he closed the gap by the time I reached the mine’s entrance. We were safe, and I was glad for that. But what had he seen back there? What motivated him to sprint over rock-strewn rail tracks in total darkness? “What did you see?” I huffed once outside. “There’s a body in there,” he said. I might not have believed him had he not filmed the whole thing. Tyler took acting and practical jokes to near obsessive levels. But this time his expression was horrifically genuine. There was a body in that tunnel, and now we had to figure out what to do. He breathlessly described the scene in unusual detail, then rewound the tape and played it for me from the point he left me. Darkness, breathing, and footsteps, continuing to the end, where a panicked Tyler whispered, “Oh my gosh!” and started yelling. That’s when I finally caught on, and that’s when his voice cracked. I should have seen it coming from a mile away. I’d witnessed many of his stunts like this– like when he wandered off at 2 am into a ghost town graveyard to scare a friend’s little brother, or when he bit a dead rattlesnake in half to make a couple young guys at camp think he was crazy. Tyler’s no longer insane, I don’t think. The pranks faded as we got real jobs and started raising families. But I’ll never forget the very real terror I felt as I dashed from that mine, and the delight as my terrified nieces and nephews tensely listen to the story every year. There’s still one thing I wonder about, though. Something that dogs me to this day. Something drove my friend to walk in darkness to the end of a potentially deadly mine shaft. The dead body thing was a joke, but Tyler never told me what was really at the end of that adit. And every fall, I start to wonder. The following originally appeared in the March 19, 2009 edition of the Tooele Transcript Bulletin. Dog it, Andy!” Dayland screamed, as Andy aimed his Dodge Ram toward another gaping dip in the dirt road. “Dog it!” Andy smiled, locked his hubs, and hit the gas. Wild-haired and volatile, Dayland looked like a teenage Christopher Walken with the voice and demeanor of that know-it-all kid in “The Polar Express” movie. Nobody’s sure why he called the retrospectively unwise act of rushing dips “dogging.” Come to think of it, I’m not exactly sure how he ended up camping with us in the first place. No matter. Dayland was just another amusing element in what may have been the seminal exploit of our lives to that point — a four-day west desert safari. I recalled that trip from 16 years ago as I drove west toward Skull Valley last weekend with my 3-year-old son Coulter. He sat in his car seat eating Swedish Fish and staring inquisitively at the salt swamps and sunken fence posts along I-80. I wondered what thoughts were churning in his head as he nodded off at the Dugway exit. At 9.5 miles south of the exit, the Horseshoe Knolls Recreation Area isn’t a pretty place by most standards. It’s a barren, hilly area overlaid by a network of well-trod dirt roads and heavily used camp sites. Every father, scoutmaster, and shotgun enthusiast knows about the knolls. Growing up, I must have camped there eight times a year. But as highly trafficked as the central area is, comparatively few people take time to explore the ridges and castle-like buttes that lie to the east. It was at the base of one of these unnamed ridges that our rag-tag group made camp 16 years ago. There were 13 of us, give or take. Some of us were buds already. Others, like Dayland, were acquaintances or friends of friends who happened to show up. This wasn’t our first foray into the great western wilderness, but for many of us it was our first extended camping trip sans an adult presence. That meant four full days of wandering aimlessly through the hills and lounging beside a round-the-clock campfire. My supplies were scant. I brought a sleeping bag, a machete, a pack of Little Smokies, and a few cans of beef stew. There may have been a tent or two in camp, but most of us laid our sleeping bags out on ground tarps. Our days involved heroic feats and various rites of passage, each day playing out like a chapter of a Homeric poem. We caught snakes. We swam in Horseshoe Springs. We drove to Wendover for a buffet dinner because, as we reasoned, “It’s so close — aren’t we about halfway there already?” For the record, Wendover is exactly 87.6 miles from our campsite — nearly twice the distance back to our homes in West Valley (a slight miscalculation on our part). The BLM prefers to call the playa west of Lone Rock “the mud flats.” True, you can’t set land speed records on them, and you won’t cauterize your eye sockets if you look at them without sunglasses. But if you’ve ever played tackle football there, you can’t help but notice the thick salt surface. We scrimmaged one afternoon until we were sufficiently battered. Then we cruised the flats in dune buggies. The bonfire was the centerpiece of evening activity. Chan and Tyler would log the day’s activities in their journals. John would repeatedly leap over the fire. The rest of us would follow suit. As the evenings wore on, we’d talk about girls we liked and lay out game plans for wooing them. I happened to have some U2 on my iPod Saturday, which I cranked up as we turned onto the dirt road at Horseshoe Knolls. I worried about mud and clearance, but the roads were surprisingly solid. I drove out toward the ridge and parked before the road got rough. This was the family van, after all, not Andy’s Ram. We’d have to hike the rest of the way. The campsite looked much the same as it did the last time we were there. It seemed in better shape than in recent years, when it was overrun and littered with glass bottles and shotgun shells. There was our fire ring, the tree John would hang his hammock from, the trail leading to the top of the ridge. We hiked past odd rock formations and faux caves to the top, where we stopped. Had we more daylight, we could have continued along the ridge and back down toward the mouths of North and South Broons canyons. Coulter stopped and selected two sizable boulders and handed them to me. “Daddy, you hold these giant rocks.” Like his older brothers, Coulter saves rocks from each trip to remember them by. By the time our van was back in view, I was carrying the boulders and Coulter along with them. It’s been 16 years since the camp that sealed friendships and fostered a deep love for this desert. I have four children now. I no longer leap through fires or catch snakes, and I tend to over-pack for camping trips. Yet I still feel like a kid when I’m in the desert. Some things never change. We’re in the car so my handwriting isn’t very great. Well, it’s been quite the adveturous camp. We got up here Wednesday night right after Brandy-o- hurt her neck. We came and sang to Dayland. We went to bed on the ground at about 3:00 AM. We woke up when Lott and Tanner came up. We went 4 wheelin. We, at that point, palyed football at the salt flats. Me and Chan climbed lone rock. We then proceeded to Horseshoe springs where we swamin the sludge and scum. Tyler ate a snake. Kelly talked about guns and such. Our good buddy Rob Osborne came and we sat by the fire some more. MOst of us left and ran through the wilderness screaming. Some idiot in bare feet came after us with a club. We came to Nevada and almost got our cameras confiscated when we had Juan and Trujillo take our picture with fries up our noses. Oh, yeah (NEXT PAGE PLEASE) I forgot, we swam in the grime again. Where was I? Oh, Wendover! We walked through the skywalk and then down the street to Nevada Crossing where we stuffed ourselves with food. MM, good. We, at that point, came back and now we are in the car. I am looking forward to another fun-filled night here in the wilderness. Remember, Anaqu la mona se vista de seda, mona se queda. Anyway, I love the Buds and I love camping. -Brandy-o was a a high school friend who hurt her neck in a cheerleading accident during a football game the night we left. She’s feeling much better now. -You’ll have to ask Tyler about eating the snake. To simply say there’s more to that story would be the understatement of the year. -The barefoot guy with the club? Eh, it’s better left unsaid. -Juan and Trujillo were waiters in the restaurant that night. The restaurant is inside a casino. Casinos don’t appreciate cameras (or their employees taking pictures of high school kids with fries up their noses). Apparently Juan and Trujillo didn’t get that memo. This article originally appeared in the January 9, 2009 edition of the Tooele Transcript Bulletin. It was my favorite flashlight. A top-of-the-line, military-grade submersible Pelican. The box it came in said it was built to take a beating. Apparently Pelican’s gear testers never dropped one while barreling at 20 mph down the side of a snowy mountain. I didn’t see its shaft snap against the trunk of a large pine tree after flying from my coat pocket. I only heard it. And I couldn’t have stopped to retrieve its cracked remains if I tried. In fact, attempting any kind of self-arrest at that point was probably the worst thing I could do. The best plan of action now was to focus on dodging trees myself and finishing the run in one piece. I’m not sure which of my friends first came up with the idea to go garbage bag sledding down Broads Fork in Big Cottonwood Canyon. But it was a favorite pastime in our late teens and early 20s, a time when little mattered to me aside from climbing mountains and nurturing a moderate-to-severe obsession with flashlights. No lifts, protective gear or groomed treeless slopes — just a box of Glad bags and a snowy forest. We’d hike a mile or so up the ridge, don our trash bags, then hurl ourselves onto the slope. We’d weave through the trees shouting manly and triumphant things until we slid to a stop in the paved parking lot. That day, Matt, Chan and I had synchronized our launch. We slid together for the first 20 yards or so until a felled tree split us up. I veered uncontrollably onto a steeper and more densely forested section of the slope. After a few close calls, I was able to correct my trajectory enough to avoid landing in Big Cottonwood Creek. Aside from a bruised ego and a scratched up leg, I made it to the bottom none worse for the wear. I was sad about losing my flashlight, but eager to hike back up the mountain and make another run. The blizzard during this past Christmas brought that perilous run back to mind. By the time my family and I left Grandma’s house in Magna late Christmas night, the storm had deposited nearly a foot of snow and was still raging. The few cars that dared venture onto the streets were ambling along, trying desperately to avoid sliding into curbs and each other. SR-201 looked like it hadn’t seen a plow all evening. Yes, we technically were. But I played it cool. The family needed a confident leader to steer us safely home. I navigated the narrowing corridor, straining to see through the relentless rush of powder. Visibility at some points was zero, and if my heart wasn’t physically beating faster, it sure seemed like it was. The thought that my sister had totaled her car on an icy freeway a few weeks ago wasn’t helping. Neither was my driver-side windshield wiper, which cleaned the top and bottom of the window nicely but left a wide streak of salt and ice right at eye level. The babies slept while the older boys played their Nintendo DS games that Santa had brought them, completely unaware of the dicey situation. As I tried to follow a pair of fading ruts, I couldn’t help but recall those snow adventures of the old days and how my perspective has evolved since then. The fact that I now have a family and responsibilities probably accounts for the added anxiety and caution. But there’s something else. Back then I loved the snow. I lived for it. I used to dream of a white Christmas. Nowadays I’m more of a “Mele Kalikimaka” kind of guy. Age — or something — has tempered my enthusiasm for winter weather. Outdoor activities are still a blast during the cold months — it just takes me a bit longer these days to warm up to the season. The blizzard continued as we rounded the Oquirrhs and turned on to I-80. The freeway was clearer, but slicker too, and the Tooele exit couldn’t come soon enough. My blood pressure began to drop again once we exited and passed the truck stops. Appropriately enough, the storm let up just as we pulled onto our street. One neighbor was still out pulling kids on a sled behind his ATV. I nodded toward the church parking lot and asked my wife if she was up for pulling a few donuts before we pulled in for the night. “I’m kidding,” I said before she could respond. Only I wasn’t. Something about the ATV and the sledders — and possibly the relief of having survived one the worst storm I’ve ever seen on those roads — awakened a long dormant sense of snowy adventure in me. We pulled into our driveway, breaching a field of untouched snow that stretched seamlessly over the yards of several houses on our street. When the van was parked, the boys looked up from their video games. Their eyes lit up at the sight. They opened the door and dashed through the drifts in their pajamas, giving no thought to the cold. I grabbed our snow shovel to clear a path from the van to our front door and watched them pluck icicles from the rain gutter chute. As I walked in the house, I peeked into the garage to spot our sleds. Tomorrow, hundreds of kids would crowd the Millpond gulch in Stansbury Park with their tubes and sleds. We’d be there too. No fancy lifts, high tech gear, or groomed slopes — just a snowy hill and a couple of Wal-Mart sleds. After a lukewarm, so-so start, winter has officially taken the stage. And the boys and I are ready to take it on. “Clint — run! Don’t stop!” I had Tyler by half a football field but he easily closed the gap by the time I reached the mine’s entrance. What had he seen back there? What motivated him to sprint over rock-laden rail tracks in total darkness? I might not have believed him had he not filmed the whole thing. After all, this was the guy who once bit a rattlesnake in half for the pure fun of scaring a couple young guys at camp. Tyler took acting and practical jokes to near obsessive levels. But this time his expression was horrifically genuine. There was a body in that tunnel, and now we had to figure out what to do. Most people keep mental lists of some kind — best television shows, favorite ice cream flavors, dream vacations. I keep a mental list of good nights of sleep. Strange, I know. But sleep for me was hard to come by, even back then. And a good night’s sleep while camping is always a rare and memorable occasion. If there was a set of Murphy’s laws for sleeping outdoors, the first would state that “the attempt to slumber triggers a physiological sharpening of the ‘uncomfortability’ sensory receptors.” The little rock that seemed negligible when I first lay down will grow into an enormous boulder as the night wears on. The slight depression in the ground beneath my left shoulder will gradually feel like a massive crater. And that Gatorade I had by the fire an hour earlier? Yeah, that’ll come back to haunt me too. But only after I have already overcome the boulders and craters and am finally comfortable enough to nod off.